Michael Kors Rhea Leather Merlot Wine Red Backpack Medium 100 Authentic Handbag. Condition is Used. Dispatched with Royal Mail 1st Class. Bag is secured with a clasp fastener. Interior has a slip pocket and is lined in pale Tan soft velvety fabric which is in very good and clean condition throughout. Size of bag approx : 9.5" at widest point x 8.5" high (24 cm x 21 cm) with a strap - length 22" (56 cm) when worn over the shoulder or across the body (44" - 112 cm from end to end). Vintage Red Leather Cath Kidston Bag. Brand new and never used. Please note the clasp on the bag is broken so it does not close properly. Comes with removable/adjustable strap and with it's original duster bag. Other than the fault noted it is in perfect condition. Will be sent on a tracked service 2 day service. Bag is secured with a goldtone clasp fastener. Lined in Black leather which is in very good and clean condition throughout. Size of bag approx : 11" wide x 8.5" high (28 cm x 21 cm) with a short, carrying handle and a detachable strap - length 16" (41 cm) when worn over the shoulder (32" - 82 cm from end to end). French ConnectIon Cross Body, Shoulder, Evening Bag . Heavy Chain Strap. Condition is Used. Dispatched with Royal Mail 2nd Class. Buttersoft black leather crossbody style bag by Rowallan in a very good and clean condition, expected signs if wear: creasing to leather. The small (but important) print. 2 outer pockets - 1 zipper to back and 1 to front under flap. Ssusiee Shoulder bag fine grain cow leather bag. This is genuine Ted Baker bag. It closes with fold-over clasp. The clasp does have wear and tear sign. Inside the bag there is Ted Baker lining (polyester). Condition is Used. • Saffiano leather. • Gold tone hardware. • Double handles with 4" drop. • Adjustable strap with 22" drop for shoulder or crossbody wear. A lock can be fitted on this if needed. Large zip pocket inside. The leather is thick and soft. TED BAKER LEATHER AND CANVAS HANDBAG/CLUTCH BAG. HAS TED BAKER LOGO. BLACK LEATHER DETACHABLE STRAP 17”. IN BLACK LEATHER AND FLORAL CANVAS. Michael Kors Rhea Leather Merlot Wine Red Backpack Medium 100 Authentic Handbag. Dispatched with Royal Mail 1st Class. 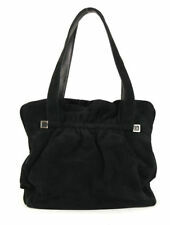 Beautiful LK Bennett black leather tote bag in very good condition. Zips at sides of bag enable you to adjust the size to suit. Height 31cm(12"), width 38cm (15") at base, 17-48cm (7-19") at top deeper bring on zips being open or closed, depth 14cm (5 1/2"). Clasp close with internal zip pocket, key strap and additional pouch. Dispatched with Royal Mail 1st Class. Internal zipper pocket and gadget pocket. Strap drop length when over the shoulder max. Clean condition lining. BCBGMAXAZRIA FRAGRANCE. COLOUR : PINK SNAKESKIN DESIGN. 100% BUTTER SOFT LEATHER. st Class Signed For within the UK. Emilio Pucci. Snakeskin effect Suede Clutch Bag. Silver clasp fastening. Silk lining. Inner pocket. Pictures are of actual item. For sale is a stunningly beautiful AllSaints Spitalfields ladies Leather Crossbody / Shoulder Bag. Magnetic clasp fastening, non removeable shoulder strap. Braided handle and details at each side. “EDINA RONAY” DESIGNER BLACK LEATHER SATCHEL-STYLE TOTE / SHOULDER BAG & CHARM!! EDINA RONAY. THIS GORGEOUS BLACK LEATHER SATCHEL STYLE SHOULDER BAG IS BY LONDON DESIGNER “EDINA RONAY”! A REALLY LOVELY DESIGNER BAG BY “EDINA RONAY”, PERFECT FOR ANY OCCASION! M & S COLLECTION CHESTNUT BROWN LEATHER SATCHEL / MESSENGER/ CROSS BODY BAG.. This is a super m&s collection chestnut brown bag. In super used condition. "fun novelty item. Was sent wrapped in beautiful gold paper A ". All natural products such as leather or canvas can have slight colour variances and natural markings which is normal. 2 side zipper pockets. Downsize your carryall for nights on the town. Perfectly polished, the Ava crossbody is shaped in a sophisticated top-handle silhouette embellished with crystals and mini studs. 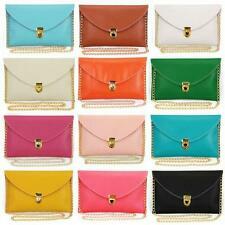 Ava Extra-Small Embellished Leather Crossbody. The Vienna Red Crossbody Bag features leather-like material, crossbody style . VIENNA RED CROSSBODY BAG. snap twist closure, large main pocket, internal zipper pocket. We're here to help! Condition / PRE-LOVED.